April is national poetry month and Thornton Academy celebrated that fact by hosting a poetry slam event on Thursday, April 5. Over 200 students, parents and teachers crowded into the atrium of the school to listen to 2.5 hours of original work performed by the students of the school. Port Veritas, a Portland based organization whose goal is to engage, enlighten, educate and entertain, helped to organize and emcee the event. The program was divided into three sections. In the first part, host Nate Amadon, invited first-time performers to stand in front of the crowd and listen to their words. The poets in this group did not want to be a part of the competition, but simply wanted to perform. The assembled crowd cheered and clicked their hands as one by one the students took the stage. The middle of the performance was devoted to the writing program that the counselors at Family Crisis Services and Caring Unlimited have started at the Cumberland County Jail and Maine Correctional Center. Jenny Stasio, a counselor who regularly works with female inmates, explained to the crowd that the writing program has kept many of the women connected to the family and friends. “Some of these women have changed their lives and this program has given them something to hang onto,” she said. 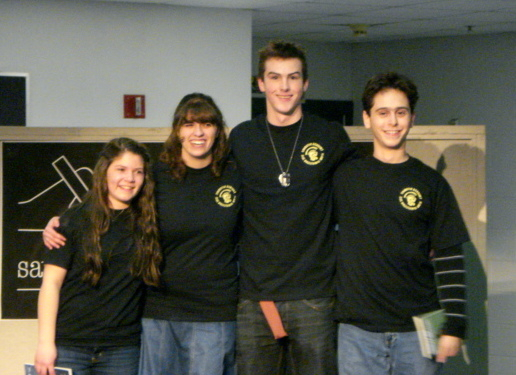 The evening ended with a slam poetry contest and ultimately 4 students were named to a Thornton Academy poetry team. Hope Hall, and English teacher at the school said the team would compete and meet with other high school teams from around the state. “This is just amazing,” said Jill Kehoe, a mother of one of the contestants and director of the school’s library. Kehoe said she and Hall would try to organize one more event like this before the end of the school year.